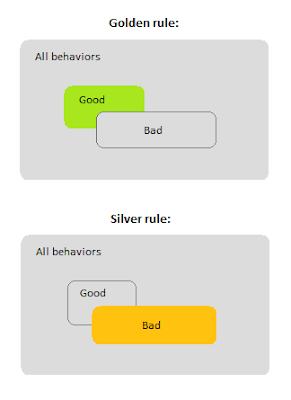 The Wikipedia article states that this is equal to the Golden Rule, just stated in negative form. I find this not to be the case. I rejected the Golden Rule when I was little. My father mentioned it to me several times in an attempt to teach me about life. I just found it dumb, but in a confusing way. I didn't know exactly why. Matthew 7:12: "So in everything, do to others what you would have them do to you [...]"
Luke 6:31: "Just as you want others to do for you, do the same for them." According to this, people who use homeless shelters are of three kinds:One or two nights only. These people get on their feet and never come back. About 80% of people.People who come periodically and stay for several weeks at a time. Mostly druggies.Hard-core homeless, keep coming back all the time. About 2,500 of them.Well, it turns out that the cost of that humble cot those hard-core homeless sleep in every night is about $66 dollars per night. So each one of those 2,500 hard-core homeless causes New York City damage to the tune of $24,000 a year - just for the cot alone. Senator Bernie Sanders recently remarked this in his comments on the crisis:This country can no longer afford companies that are too big to fail. If a company is so large that its failure would cause systemic harm to our economy, if it is too big to fail, then it is too big to exist. If it is too big to fail, it is too big to exist. We need, as a Congress, to assess which companies fall in this category. Bank of America is certainly one of them. Those companies need to be broken apart. We cannot have companies so huge that if they go under they take the world economy with them.I most certainly agree. There is a tendency these days for companies to grow beyond any economically substantiable limit. Corporations grow for the entirely wrong reasons. It has become an oft-repeated statement that American middle class household income stayed flat over the past quarter century, and that income gains have been accruing only to the wealthy. Income gains over the last 30 years have been systematically understated due to several factors. These include:Fall in people per household. [...]Earned income tax credit effect. [...]Income mobility. [...]Thanks to Rok Spruk for linking to this. This is how insane Saudi Arabia is:The most senior judge in Saudi Arabia has said it is permissible to kill the owners of satellite TV channels which broadcast immoral programmes. He was speaking in response to a listener who asked his opinion on the airing of programmes featuring scantily-dressed women during the Muslim holy month of Ramadan.Consider that, in their country, such attitudes can be considered normal. A couple of snippets from the paper:Smith GCS, Pell JP. (2003). Parachute use to prevent death and major trauma related to gravitational challenge: systematic review of randomised controlled trials. BMJ, 327(7429), 1459-1461. This is just the beginning - Google Chrome is far from done. [...]Microsoft has two vast revenue streams: Windows, and Office. Google already has web-based competition for Office, but online applications are still severely hampered by the capabilities of today's browsers. For now, this has tilted the playing field in favor of traditional applications that install on the user's machine, providing superior functionality.